Beijing, China: June 19, 2013- esProc Dev developed by Raqsoft was recently launched to bring higher development efficiency. According to Raqsoft, the business intelligence solution provider, this professional developer tool features with ease-of-use development environment, better debugging, and powerful computing ability. Data analysis and query are essential for data computing. Report data source preparation and data management & ETL also involve data computing. Although SQL, R, Java, C language and other current solutions have powerful computing ability, coding for complex computing is rather cumbersome. Even R language is agile, but it’s too difficult to understand for nontechnical people. In order to enable convenient complex computing, esProc Dev comes in users’ sight. The development environment of esProc is very easy to use. The script is written in the grid, which avoids formatting and the script is clear and easy to read. For instance, the script will be auto-aligned according to the gridline. For long scripts, such as judgment statement, loop statement, etc., indention can directly represent the scope of computing. Besides, the step by step computing mode enables complex computing goal to be divided into multiple simple steps, which greatly simplifies complex problems. 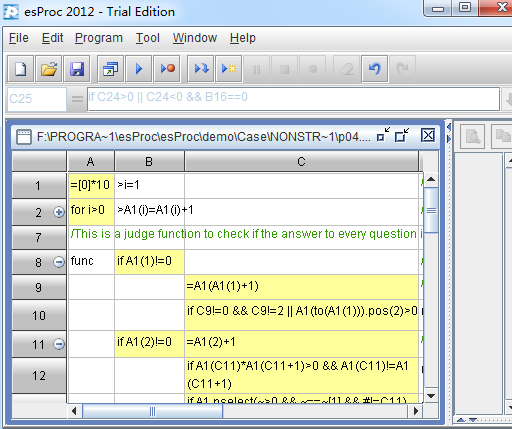 With grid-style interface, esProc can easily realize step-by-step computing and results reference. Better debugging features of esProc brings development efficiency. esProc provides the perfect debugging functions, with support for the breakpoint, single step, and run to cursor functions. Unlike many long SQL/SP statements, which can only be composed and comprehended as a whole, esProc enables separate script writing. In this case, the internal working details can be monitored. For example, for grouping and summarizing, esProc can implement them in 2 steps, while SQL can’t. What’s more, esProc supports explicit set, ordered computation, object reference, real grouping and cross-database computing, which makes it have more efficient development capability than SQL. esProc has powerful data processing ability. It’s known to all that Java is not good at complex computing, especially the structured data computing. But esProc provides a richer and more complete system of structured data computing and easily achieves different complex computing demands. It can also seamlessly integrate with the main program in the form of standard JDBC embedded into Java applications. In addition, for a system where Java reporting tool is adopted, esProc is ideal to perform the complex computation, compute with multiple data sources, and clean the dirty data sources. The reporting tool can receive the result returned by esProc via JDBC interface by taking esProc as a database.